Photo: Girls at our girls home are happy to show us that the hen house is back up and running, providing nutrition and critical funding needed for their programs. 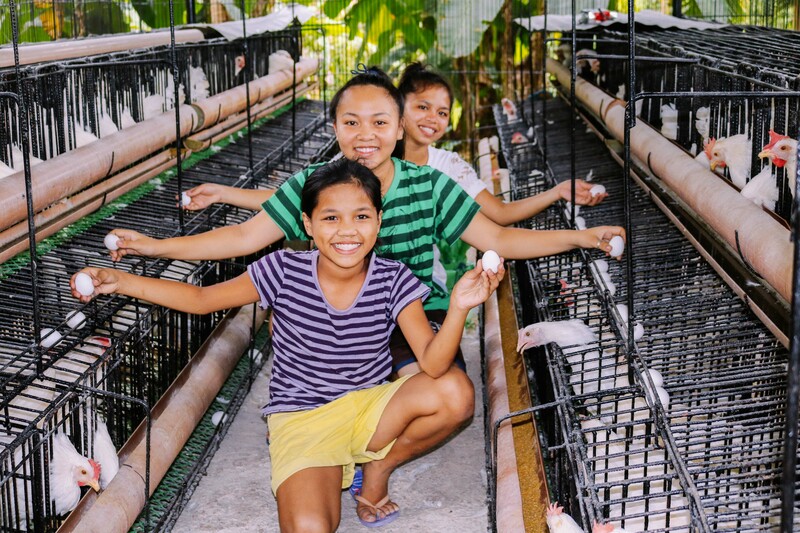 We are excited to share an update about our hen house project which we recently relaunched as part of our farmland enterprise on the island of Cebu, Philippines. On July 15th we purchased 250 young hens which will lay eggs for 4 years — once the hens reach maturity, they will produce around 1,000 eggs weekly. There is such a high demand for fresh eggs from local neighbors that our native team will sell them directly to the consumers on a daily basis. The weekly net profit from selling our eggs will be around $114, and the monthly net profit will be around $458. Thus, the estimated net profit for the 250 hens’ 4-year egg-laying lifespans will be a projected total of $21,984. Along with your support, the restarting of our hen house project will help with some of our funding challenges, providing more profits to help at-risk children and orphans succeed in school. In further good news, other parts of our farmland enterprise on Cebu continue to thrive. We currently have 92 banana trees which will be harvested again next week — our last harvest yielded 7 large stalks of bananas. An average single harvest yields a profit of $6.00 which quickly adds up as we harvest bananas every week. We are also now growing papaya plants, our newest crop, which are harvested monthly. And we are cultivating chilies as well, which are harvested weekly. Our goat farm is another one of the many agricultural projects located on our Cebu campus which provides food for the children in our programs and supplements funding for our Cebu projects. We currently have 13 healthy goats, and 10 pigs living in our recently-repaired piggery — the pigs should be matured and ready to sell to market next month. We are thankful that our fishery operation continues to run smoothly with approximately 1,800 healthy fish, and that recent on-demand sales continue to yield steady profits. This is a positive result to making a change to our sales plan recently: instead of doing mass harvests to sell to market vendors, we are now selling smaller harvests on demand to families and smaller vendors. 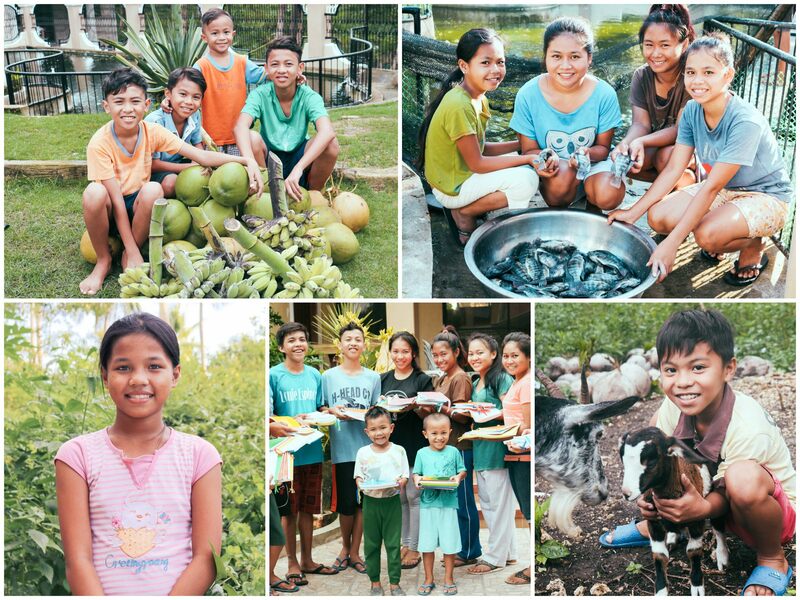 Photo inset: (Top-left): Our Cebu team has 92 banana trees which are harvested weekly. (Top-right): Fish from the fishery operation on our Cebu campus are sold to local families and vendors which supplements funding for our Cebu programs. (Bottom-left): “Ligaya” is thankful to be enrolled in our Cebu Children’s Hope Center where many of her educational and nutritional needs are being met. (Bottom-center): Our Children’s Hope Center recently provided the 40 children enrolled essential supplies for back-to-school. (Bottom-right): Our Cebu goat farm currently has 13 healthy goats which provide food for the children in our programs. There are currently 40 children (ages 5-17) enrolled in our Cebu Children’s Hope Center, an after-school care program which includes homework tutoring and other activities, along with snack and meal services for children suffering from extreme poverty. With your support we are able to feed the children delicious meals which include nutritious items such as rice, green leafy vegetables, fish, and eggs. We also provide them with snacks of bread and juice as they work at the Hope Center. The children started back to school on June 5th where they have been studying English, math, science, and fine arts. And thanks to the profits from our farmland enterprise and your generous donations, our Cebu Hope Center program came up with the funding to equip these 40 children with back-to-school essentials such as paper, pencils, ballpoint pens, crayons, and notebooks. We want to share the redemptive story of a child who enrolled in our Cebu Children’s Hope Center last year, 10-year-old Ligaya. She has always been a very smart and bright child, but her family lives a life of extreme poverty. Her mother does not have a job and her father works a low wage job, thus they were not able to provide for Ligaya and her sister and 3 brothers. When Ligaya’s family learned about our Hope Center program, she was elated to be enrolled as a beneficiary where now many of her educational and nutritional needs are met through homework tutoring, fresh-cooked meals and snacks, and the necessities required to attend school such as a school uniform, new shoes, and school supplies. Her favorite subjects in school are English and her native Filipino language, and when she’s not studying, she loves to play volleyball. Ligaya is extremely grateful to be enrolled in our Children’s Hope Center where she feels the tender care and help of the loving staff members toward herself and the other impoverished children who now have great hope for their future. As always, thank you for your steadfast prayers and support which enable us to continue to enrich the lives of our children and to break the devastating cycle of poverty.